i ate an obscene amount of delicious homemade pupusas (latin american maize “biscuits” stuffed with cheese and jalepenos) at a party months ago, and i’ve craved them ever since. i still haven’t taken my friend up on her offer to teach me how to make them, but when i found a very simple arepas recipe in cookie magazine this month, i made them asap. 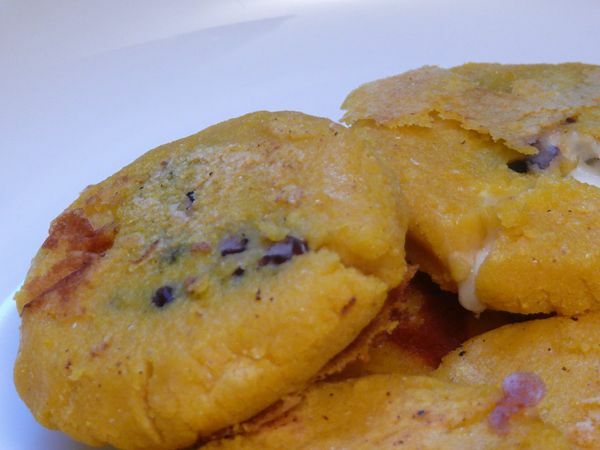 areapas are a cousin of the pupusa but made with a pre-cooked corn flour this time, and griddled. the question was, what to serve them with to round out the meal? 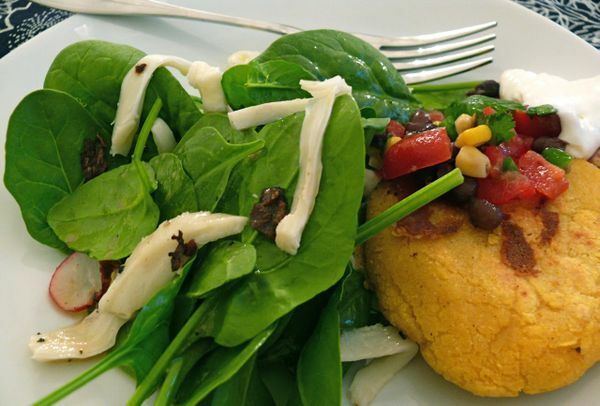 burnt or not, i still enjoyed the taste of the chilies with the radishes and spinach and loved the idea of this salad served beside the arepas. so i created my own version of the salad with fewer ingredients, a simpler process, and, if i may, a damn good result. what makes this salad so great and a little unique are the chilies and the cheese. i always have dried chilies on hand–i think everyone should. dried chilies are not just for spice-addicts; they are commonly used to start tomato sauces and can be substituted any time a recipe calls for chili flakes. the flakes that you get from crushing your own dried chilies are even better than store-bought flakes, because at home you can remove the seeds (which can be bitter) and use the flavourful outer parts alone. plus you can vary the flavour of recipes by using different chilies. it’s best to store any dried food in an air-tight container to prevent them from going stale. stale dried chilies will not crumble well and you need tiny pieces here since HOT is not what we’re going for here–just a nice surprise of spice, and all of that smoky, chili flavour. and if you’re having trouble getting your hands on oaxaca cheese, use the mild-flavroued, melty, stringy substitue we can get easily: mozzarella. they are similar in texture and taste and both are made by stretching the cheese which allows you to pull apart strings for this salad. slice chillies lengthwise and shake to remove seeds. remove stems and discard stems and seeds. slice chillies into long strips, then cut crosswise into tiny pieces. “unwind” ball of oaxaca as much as possible and working from the inside or wherever you can see the grain, tear thin strips along the length of the cheese. keep tearing thin strips off until you have about 1 loosely packed cup. whisk the oil, vinegar and mustard well, and season with salt and pepper. 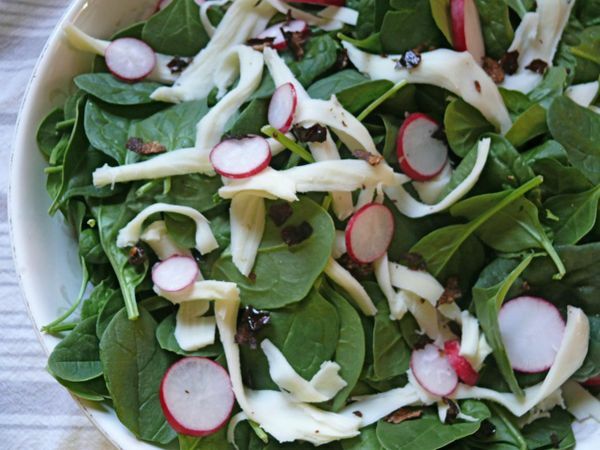 combine the spinach, radishes, cheese and chillies in a bowl. add the dressing and toss well.